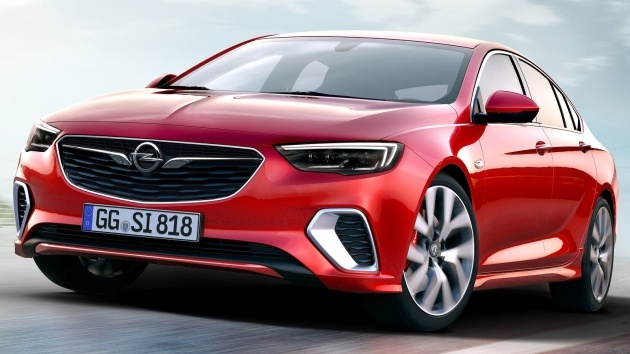 The hot version of the latest Opel/Vauxhall Insignia, revealed in December 2016, is out. The Opel Insignia GSi (or Vauxhall Insignia GSi in the UK) will make its motor show debut at IAA Frankfurt in September. 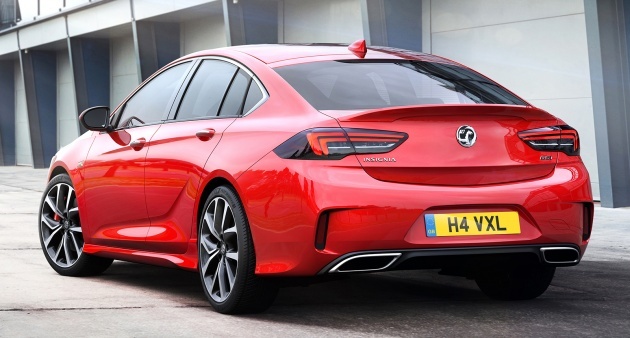 It will also be available in the US as the Buick Regal GS. The Insignia continues a long tradition of sporty Opel models with the GSi badge, which was worn by cars like the Manta GSi and the Kadett GSi (115 hp from 1.8L) in 1984. Four years later the 2.0L DOHC engine in the Kadett 2.0 GSi 16V delivered 150 hp. The first Astra also featured this engine and in 1993 there was a 1.8L 125 hp alternative in the Astra GSi. Various generations of the Corsa received the GSi treatment as well. Today’s sport sedan is powered by a 2.0 litre turbo-four with 260 hp and 400 Nm, mated to a new eight-speed automatic transmission with steering paddles. With the transmission shifting automatically, the driver can preselect the shift points in Standard and Sport modes. There will be a diesel option as well. Developed at the Nurburgring, the Insignia GSi sports 10 mm shorter springs and unique shock absorbers to reduce body movements. It also comes with four-pot 345 mm Brembo brakes and a mechatronic FlexRide chassis. AWD with torque vectoring is standard, and the hot Insignia rolls on Michelin Pilot Sport 4S tyres and optional 20-inch wheels (18-inch standard). Besides Standard, Tour and Sport modes, the GSi gets a Competition mode, which is activated via the ESP button. A double-press gives drivers more yaw and switches off traction control. The Insignia GSi is quicker on the Nurburgring than the more powerful previous-gen Insignia OPC, as it’s 160 kg lighter than the 2.8 litre V6 turbo old car. It looks really good as well. Chrome-edged air-intakes are located ahead of the front wheels and the rear carries a functional spoiler. The rear apron is styled like a diffuser and features two chrome pipes. Inside, there are new AGR-certified sports seats. Just like in the Insignia Grand Sport, it offers ventilation, heating, massage and adjustable side bolsters. Here, the chairs have tall backs, integrated head restraints and GSi emblems. Matching the seats are a flat-bottomed steering wheel, aluminium pedals and black headlining. Rear like CLS with upside down lexus lights. No 0-100km/h or other performance data? Taboleh! Nanti itu mental patient kata tarak RV, so he will bash. Then how? In Germany and UK, this car brand is as common as Proton. Missed opportunity…otherwise this can be ‘New Perdana’..after all Opel now is part of PSA..
Next Post: AD: Own a Jaguar or Land Rover with rebates of up to RM80,000, or as low as 0%* financing!